Our upcoming Paris Lectures event on March 30th will be a different format from the norm. Instead of one great speaker, we will have 13 people presenting their unique and wonderful creative ideas. Over the last few weeks we held an open call for submissions and today we’re excited to announce the lineup – a fantastic, diverse roster of projects and people who will no doubt leave us wanting to hear more. The premise for this event is simple: Each speaker will have two minutes to talk about their work. No sales pitches. No businessy-mumbo-jumbo. Just creative people in our community sharing their ideas, processes, struggles and stories and giving our lucky crowd a healthy dose of creative inspiration. We are so chuffed to be welcoming painters, designers, photographers and podcasters from Paris, Brantford, Kitchener and more. 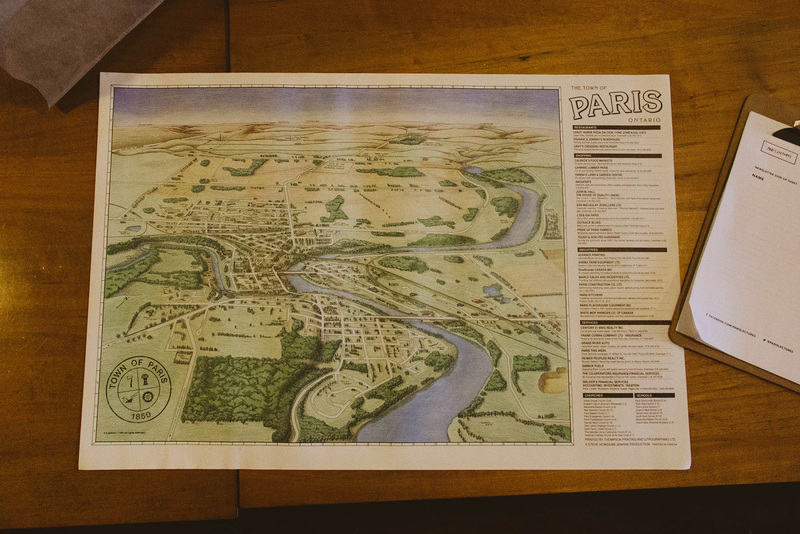 Steve Howes and Brian Jenkins are also generously donating a vintage 1989 Paris town poster for a free giveaway, woohoo! Check out the full list of speakers below. Kelly, a writer, craftsperson, designer and entrepreneur behind Rock Paper Scissors Company, and her cousin Jayne, of Jayne Westcott Photography, are uniting to share their Working Hands project with us, a photography book of hands featuring local artists. We’re eager to catch a glimpse of some of the stunning assets gathered to tell these hard-working stories. Ida is a prolific and talented photographer in Brantford. We’re honoured to see a glimpse into one of her projects, a touching series of portraits and every day lifestyle shots of a local mother and child. We’re super pleased to welcome Amanda and Matt from Kitchener to shareWays We Work, one of our favourite current online projects cataloging stories behind people and their passions. The set of interviews and photos are utterly lovely and worth a deep dive pre- and post-event. Interior designers Anne and Rick will present a project that sounds whimsical and delightful. They’ll focus on this award-winning project designed for the Junior League of Toronto at their ‘DelecTABLE Designs’ tablescaping event to raise money for charities. We can’t resist good design that accompanies goodwill. Our favourite Paris librarian has one of the most interesting life stories we’ve ever heard. We’ll leave it to her to share that story, which no doubt parallels her artistic journey. To us, Julie’s artwork characterizes her as one of the most chill human beings we’ve ever met. We’re not only excited to see more of Julie’s work, we’re excited to hear how she talks about it. She’s been one of our most loyal Paris Lectures attendees (having only missed one event due to the flu) and it’s about time we turned the tables and heard what she has to say. Holly O. is one of Paris’ best-known artists with an artistic career spanning decades. Her signature uninhibited bright colours and textures and cheery heckling from the front row at Paris Lectures have kept us on our toes for months, and we’re pumped to have her speak about how she came to live to paint and paint for a living. Kari is known throughout Paris for the homemade honey she harvests from her porch right here in town. She’s also on the hunt for more land to allow her to grow her honey operations, and we’re positive her entrepreneurial and positive outlook (through the unique lens of beekeeping) will energize the rest of us. Claire is a pal we met on twitter, and we’re looking forward to connecting in person! She is clearly dedicated to her podcast series of personal growth and expression. In her first episode, she reviews Austin Kleon’s book, Steal Like an Artist, from which we actually pinched the motto for Paris Lectures – “The world is a small town”. Small world indeed. Tim Des Islets is an entrepreneurial Parisian who founded the music management company, Noisemaker, just last year. Noisemaker currently manages the bands The East Pointers, Poor Young Things, Sun K, and Taylor Angus. We are beyond excited to hear how he approaches a business that is centred around supporting creative people. Karen’s leap into Found Studio to make metal work and jewelry has already led to stunning results. We’re looking forward to an update on her practice and digging into what kinds of inspirations leave their marks on her work. Kim and Steve, our very first Paris Lectures presenters, are returning to the stage for a brief update on the renovations to their new studio location as well as the development of their maker space, which will be sure to have far-reaching repercussions on the creative community of Paris. Steve first showed us this vintage Paris poster at our last meet-up with Him and Her. That exchange kicked off a series of serendipitous events (our trip to Thompson Printing had the owners reminiscing) and we are super excited to hear Steve and Brian Jenkins, the original illustrator, talk about their process. They will also be giving one map away to some lucky person in the crowd! As ever, we’re impressed with the solid creative community that exists beyond Toronto and Hamilton, and we think this lineup is clear evidence of that. Although our event is already sold out, there is a chance for last-minute cancellations (last time, five people had the flu), so sign up on our waitlist anyway and if we can reallocate tickets before the event we certainly will. Either way, be sure to check out more work from these talented folks and lend them your support!